Bombshell Creations was started in 2009 by one of the leading makeup artists in northeast Georgia and Athens native Jeris Farmer. She wanted to make people more beautiful in the setting of their choice and quickly became sought after through word of mouth referrals. Now she travels with her team of Bombshell Girls on-site to her client's location to provide flawless makeup and glamorous hair for every occasion. 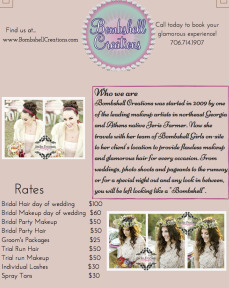 BombShell Creations specializes in Makeup Artistry including Theatrical Makeup, Hair Styling as well as Airbrush Tanning. From weddings, photo shoots and pageants to the runway or for a special night out and any look in between, you will be left looking like a "Bombshell".